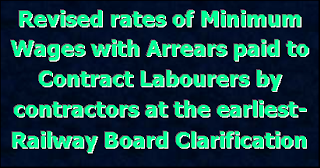 Sub: Minimum rates of wages for contract labourers. Ref: SEC Railway's letter No. P-HQ/RUL/118/3 dated 21.07.2017 on the above subject. 2. The matter has been considered in Board's office. The payment of revised minimum rates of wages to be paid by the contractors to the contract labourers is a statutory obligation. Therefore, this obligation cannot be circumvented. AND whereas the copies of the said Gazette were made available to the public on the 2nd September, 2016. AND whereas objections and suggestions received on the said proposal have been considered by the Central Government." SEC Railway has not raised any objection on 2nd Sept. 2016 or thereafter. 4. In view of the above, SEC Railway's proposal is not tenable and have no ground for seeking reference to Ministry of Labour for exemptions for the on-going contracts from the provisions of Ministry of Labour & Employment vide notification Nos. (i) 1/13(7)/2017. LS.II (ii) 1/13(6)/2017-LS. II, (iii) 1/13/(5)2017-LS.II (iv) No. 1/13/(4)/2017-LS.II and (v) 1/13(3)2017-LS.II and (vi) 1/13(1)/2017-LS-II dated 20.04.2017 revising the minimum wages and rates of Variable Dearness Allowance for the labours, circulated vide Board's letter No. 2016/E(LL)/AT/M W/1 dated 05.06.2017. 5. Attention is also drawn to provisions contained in "General Conditions of Contract" wherein the contractors are required to comply with the provisions of Contract Labour (R & A) Act, 1970 and Contract Labour (R & A) Rules, 1971, as modified from time to time, wherever applicable & are required to indemnify the Railway from and against any claim under aforesaid Act/Rules. 6. It is reiterated that Railways being Principal Employer are required to ensure that contractors should comply with the relevant provisions of labour laws pertaining to Contract Labour & Minimum Wages. 7. 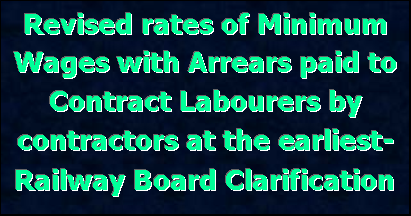 Thus, SEC Railway are advised to direct the contractors to pay the revised minimum wages along with arrears to the contract labour at the earliest under intimation to Board's office.